Join the Middle East Institute for another Brown Bag Lunch Series. 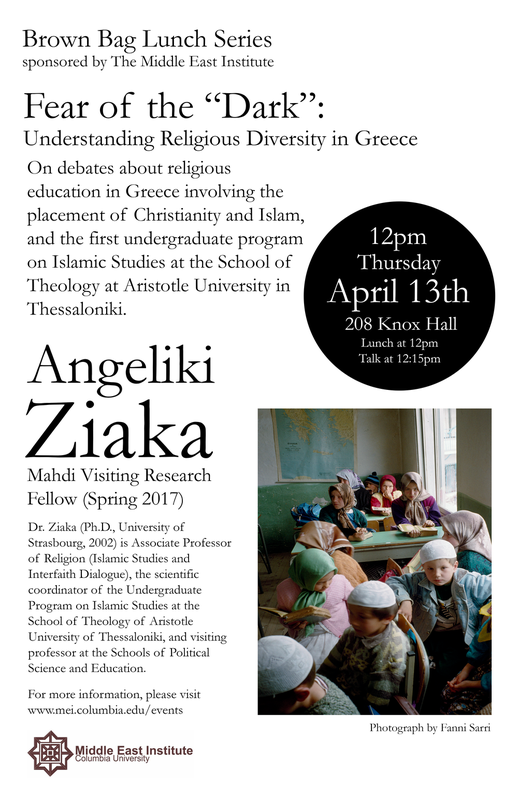 This week's lecture "Fear of the Dark: Understanding Religious Diversity in Greece" will be led by our Mahdi Visiting Research Fellow Dr. Angeliki Ziaka of the University of Thessaloniki in Greece. Lunch will be served at noon. The talk focuses on debates on religious education in Greece involving the placement of Christianity and Islam and the first undergraduate program in Islamic Studies at the School of Theology at Aristotle University in Thessaloniki. Greece is a sec­u­lar state where traditional relations between Church and State are maintained. It is also a country with an indigenous Muslim population, whose role and religion were until recently enclosed within the bound­aries of its own area (Western Thrace), while the education of its offspring took place mainly in Muslim minority schools and madrassas. In the last few decades, spanning the end of the 20th and the beginning of the 21st century, a number of rapid changes have been taking place, mainly stemming from mass immigration to Greece, the eco­nom­ic crisis and structural changes and upheavals in the neighboring Near and Mid­dle East and also in Europe. These changes have undermined ‘old cer­tain­ties’ and created new conditions and needs. Dr. Ziaka is Associate Professor of Religion (Islamic Studies and Interfaith Dialogue), the scientific coordinator of the Undergraduate Program for Islamic Studies at the School of Theology at Aristotle University in Thessaloniki, and visiting professor at the Schools of Political Science and Education. She is currently with the Middle East Institute at Columbia University as a Mahdi Visiting Research Fellow.